In the corps' fourth year of existence, Suncoast Sound finished in sixth place at the 1983 DCI World Championship Finals in Miami, Fla. Popularizing its contemporary-but-accessible musical style as "Sun Jazz," the corps turned a lot of heads during its first of seven consecutive years as a finalist corps. Bob Mintzer's "Time Out" kicked off the show with a continuous series of quick jazz melodic runs that instantly made fans sit up and take notice. For their first time in the Finals, the corps was not content to just back into the big show. They were serving notice that they intended to be regarded as a major player within the drum corps community. Don Menza's smooth jazz "Spanish Gypsy" featured the color guard performers under individual transparent white scrims, a kind of ghostly effect we would see in later years from a number of other corps. Al DiMeola's "Casino" served as the percussion feature, with the guard and brass sections marching at a fast pace during an unwinding spiral form. Arranger Robert W. Smith's hard-driving jazz rendition of "Aquarius" from the musical "Hair" featured part of the guard section with police clubs and other guard members holding protest signs, reflecting the origins of the piece as a protest against the Vietnam War. (The piece would be further explored the following year in the show that introduced a prop Vietnam Memorial Wall to the field.) Also introduced was the peace signs the corps members made with their hands, something else that would be brought back as a feature in 1984. The heart and soul of the program came at the end, when the corps presented "The Greatest Love of All" by Michael Maser and Linda Creed. The work had achieved limited commercial success with the version sung by George Benson for the 1977 film "The Greatest," a biographical look at the life of Muhammad Ali. In December of the following year, Whitney Houston would record the song for a release 15 months later. It became one of her biggest hits and instantly launched her as a superstar. A most memorable feature of this closer was the entire guard signing the lyrics with their hands. (This is prior to the single guard member signing the separate lyrics in the accompanying video clip.) The ebb and flow of the arrangement milked the emotions of the fans with a roller coaster ride of volume and tempos, capturing many moods within the same work. The final brass statement was one of the loudest moments heard on the field that year. However, Smith had one final trick up his sleeve, taking the entire finale out-of-key with one huge chord, and then providing an additional modulation with another chord that made all forget what key the piece was really in. It was perhaps the first of a series of intriguing small surprises in his arrangements for which he became well known. 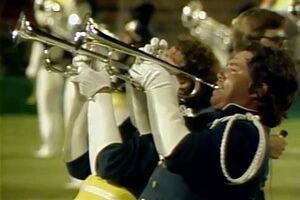 This week only, you can save on 1983 World Championship Audio and Video Performance Downloads on the DCI Fan Network. Buy the 1983 Suncoast Sound Video Performance Download. (Available this week only for $3.99. Regular price: $4.99.) (Available this week only for $15.99. Regular price: $19.99.) Offer ends Monday, Feb. 20 at 8:30 a.m. ET.